According to Ernst and Johanna Lehner in their Folklore and Odysseys of Food and Medicinal Plants, corn (which originated in Mexico) was misnamed as Turkish corn at the same time as turkey acquired its name, and for much the same reason. Europeans first saw corn, called maize or mahiz by the indigenous people, when Columbus and his followers arrived in the New World. They took samples back to Spain at the very end of the 15th century. It quickly became an important crop, successfully cultivated throughout the continent. 16th century herbalists in Europe called the new plant by various names, including Welsh corn, Asiatic corn, Turkish wheat and Turkish corn. The latter name was the most usual, since they believed that the grain had been brought into central Europe from Asia by the Turks, who had introduced dozens of other products from the east into Europe at about the same time. 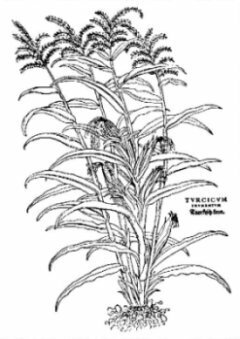 The Turks themselves called the crop “Egyptian corn”; the Egyptians called it “Syrian sorghum”… The German botanist Hieronymus Bock, in his New Kreüterbuch or herbal in 1546, remained on the fence, calling it “foreign corn”. Given the confused terminology, perhaps it is not surprising that, to quote Ernst and Johanna Lehner, “It took Spanish botanists more than 50 years to convince other European herbalists that corn was American.” Corn was given its botanical name, Zea mays, by Carl von Linné in the 18th century.